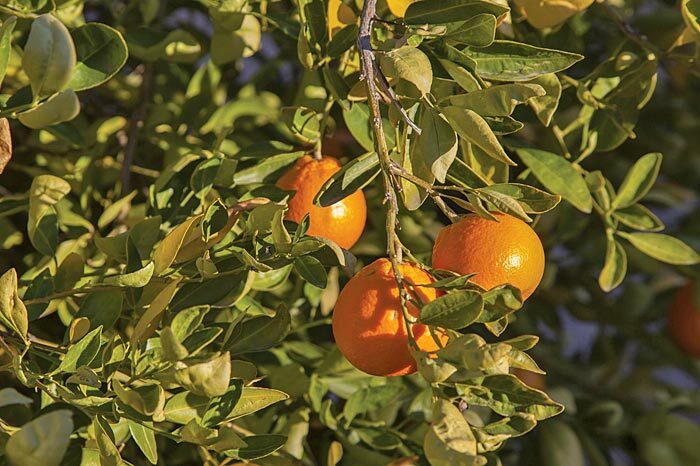 Is the quest for a remedy to citrus greening near completion? FOR THOSE IN THE FLORIDA citrus industry, some say it’s the 11th hour. Citrus harvests are down 70 percent and a survey revealed an 80 percent rate of tree infection throughout Florida. However, the quest to find a long-term solution for the dreaded citrus greening disease may be approaching its final chapters — one that scientists at UF’s Citrus Research and Education Center (CREC) in Lake Alfred hope to help write the happy ending for. According to plant cell genetics professor Dr. Jude Grosser, and professor of horticultural sciences Dr. Fred Gmitter, the story of the possible slaying of the citrus greening dragon starts with a tree propagated approximately two decades before citrus greening. “The cross was made before Dr. Gmitter and I arrived at the CREC,” Dr. Gosser observes. The Mother Tree and other hybrids don’t represent a cure, but a remedy. “The tree does get infected with the bacteria that causes HLB and it will show some of the symptoms that are typical for HLB,” Dr. Gmitter adds. “However, the trees seem to outgrow the disease. They do not die and decline like oranges will do.” And, as Dr. Grosser notes, with good care and nutrition, they will produce mostly normal fruit in abundance. Sugar Belle trees are available, though, according to Dr. Gmitter, “as growers have become aware of the performance of LB8-9 now, there is a resurgence of interest in planting this variety, and nurseries are struggling to keep up with the demand.” The trees also require top-notch care to stay healthy.